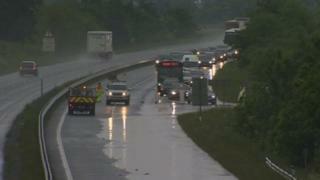 A section of the A55 in north Wales has been closed due to flooding leading to tailbacks. Floods affected the road between J12 Roman Road in Gwynedd and J18 Conwy and Llandudno Junction following heavy rain on Friday afternoon. The westbound carriageway between J11 and 12 has been closed and motorists are being diverted through Tal-y-Bont. Traffic Wales says the Conwy Tunnels westbound have been closed for safety reasons due to the volume of traffic.